"Top of the line" 17 inches POV pole made of Ultra Strong Carbon Fiber for maximum strength and light weight. Natural Rubber grip with Ergonomic design. Integrated (no screwed) robust and durable Aluminum Alloy redesigned GoPro tip, with Integrated nut that will never get lost or come apart. 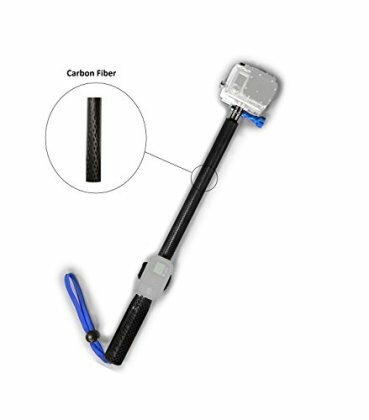 Compatible with all GoPro camera models and any camera with ¼" connector such as: Countour, Drift Ghost, JVC Adixxion, Sony HDR AS15, Muvi, ION, Shimano Sport, Sony Action Cam Mini, Polaroid Extreme, Midland, among many others. Includes: 1 x Aluminum GoPro Thumbscrew (Electric Blue); 1 x ¼" camera adapter; 1 x Wrist Velcro Band for GoPro remote; 1 x Pole Velcro Band for GoPro Remote Control; Adjustable Wrist Band. USA design for Reliable and Lifetime use.